Horseshoe Bay House sits on a block of mature native bush some 800 metres back from magnificent north-facing Horseshoe Bay on Magnetic Island. It was the potential to carve out a gladed tropical garden, with minimal disturbance to what was naturally there, that attracted the owners to the site. The house faces north over its semi-wild garden, habitat to many species of birds, butterflies, wallabies, and koalas. A robust galvanised steel exoskeleton clearly demonstrates how the building is constructed - nuts and bolts architecture. There is an easy flow between indoors and outdoors with the central deck – the dining area – being under a sail outdoors. The house has been designed to do away with air conditioning. 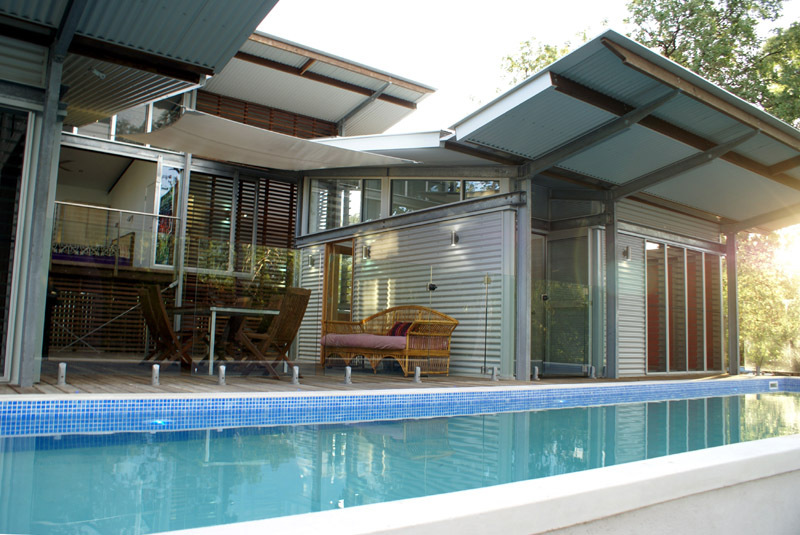 Breezeways between, through, and under the three pavilions catch the prevailing breeze and, together with wide roof overhangs, keep it cool and comfortable while allowing it to be fully opened up to the outdoors in both dry and wet seasons. The colours of the painted ply walls were chosen as caricatures of the colours outside in the landscape – lime green, acid yellow, fluorescent orange. The pool is right up close, an integral part of the house, keeping the occupants cool and fit. Horseshoe Bay House is drop-dead gorgeous to look at and is meeting all its environmental aspirations.